In this episode of Fret Dojo TV, I show you how to the infamous spider exercise on guitar, one of the best left hand technique builders I’ve come across. It’s one of those exercises that is very efficient to practice as it works on a lot of aspects of left hand technique simultaneously. It’s not an easy technique to master (anything worth going for in life usually isn’t easy!) but it is well worth the investment. Trust me :) I spent 2 weeks at one point exclusively focussing on this technique and my coordination and agility of my left hand increased drastically as a direct result. Below is the exercise notated in music and TAB, check out the video for all the details on how to do this one properly. 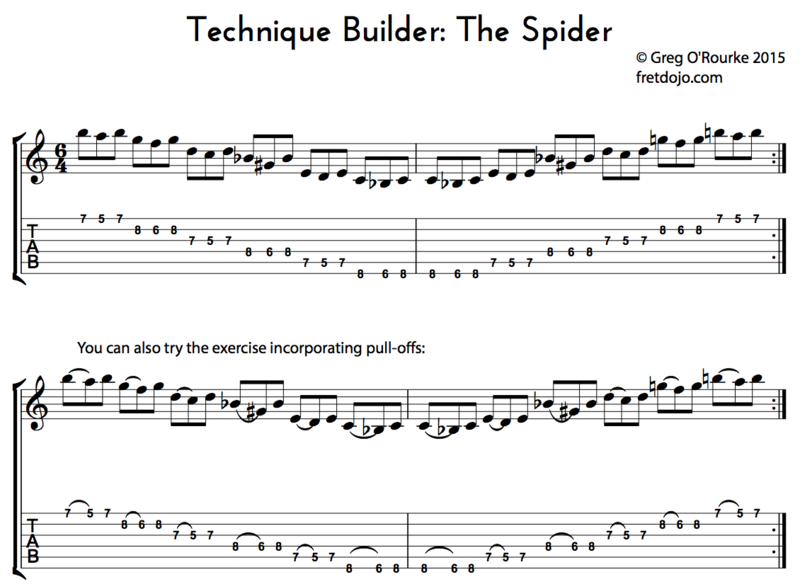 Click here for a downloadable pdf of the exercise>> Thanks for reading and I hope this exercise helps your playing as much as it did mine. Let me know how you go with this one by leaving a comment below – I read all the comments. Also, if you would like to see something in particular explained in a future episode, feel free to get in touch ([email protected]). 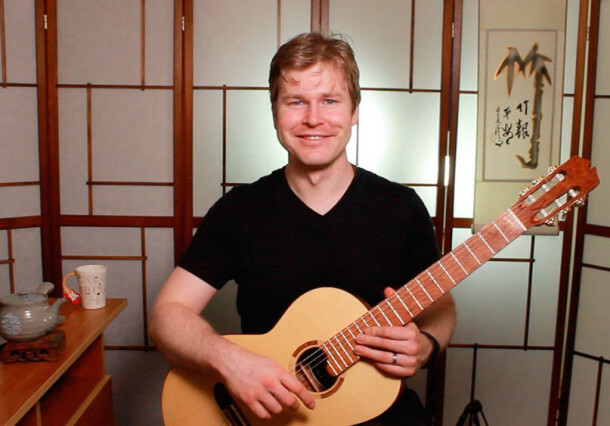 See you in the next episode of Fret Dojo TV! There’s also a great left-hand exercise called “The Spider” in Scott Tennant’s book Pumping Nylon that alternates between pairs of octaves and pairs of 10th’s..
Nice one, yes there are a few spider’s out in the wilderness it seems :) Glad you enjoyed this one! Thanks for this lesson. Just what I needed today as a fun exercise and get things coordinated. Glad you enjoyed this one Chuck! This exercise is a very good coordination builder and really helps to train the left hand fingers to find the strings easily. Happy practising! thanks so much for taking the time to share this exercise with us. I have to say though that it’s giving me a brain-ache, especially going back down the fretboard (from low E to high e). Is it normal to discover what an unco-ordinated spaz you are, or am I the only one! Well, hopefully I get better, and thanks once again.